So my post from this morning... where I called my own peeps out...Yea, sometimes the truth hurts but it needs to be said, right? Well here's a prime example of what I mean... BRAVO to my guests who sent back their RSVP... but note - What is missing? That's right ... I've got "2" Guests for each RSVP attending, but I don't know who they are... and sadly, I can't even try to deflect... the postmarks clearly indicate these are MY guests... which sadly will leave about 2-5% room for error that it is NOT a Korean person. LOL. I guess I should still give props for taking the first step though, right? That's a huge deal... LOL. I numbered my RSVPs in case that happened. Oh well. Save a see for Mr & Mrs No Name! Hilarious! It's funny how people seem to expect you to read their mind regarding the wedding. We had website rsvps - but a few people didn't see the website address, and thought they didn't have to rsvp. Lots of phone calls commenced! oh hon, that stinks!! once you get more RSVPs back you might be able to narrow it down. i know this is so after the fact, but for any new bride-to-be reading this, make sure to put little numbers on the back and then keep track of who you mail them to with the numbers. this way when they forget to put their name, you'll know who it is. Oh no...I forgot about that. So far everyone had wrote in their names on my RSVP's. yep, numbering is the best way. 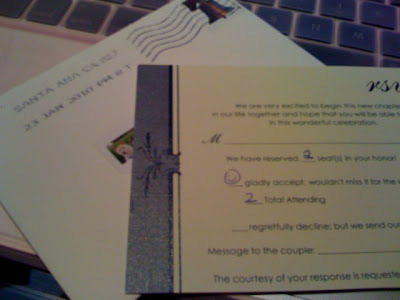 You just need to put a slight # on the back of the RSVPs in pencil so this problem doesnt happen. At least they wrote the =) which is very cute! Well fortunately for us we can learn from your mistake, and when I send mine out I will number them. Thanks for sharing, and hopefully when the rest of the RSVPs come back you can weed out who it was. well hopefully, you can figure it out through process of elim. as wedding date approaches. yikes! I was known for this!!!! For some reason I sent back RSVP's like more times then I like to admit. I'm better now....pretty sure anyways! Ah geez! 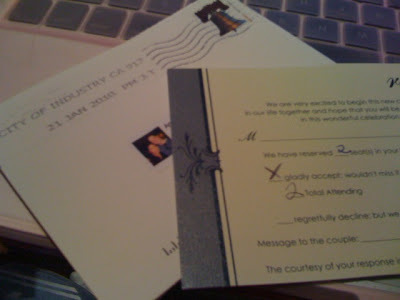 Now I am really second guessing my decision NOT to number the RSVP cards...praying that does not happen to us :( I really don't want to have to wait til the last minute and then call all the people who haven't rsvp'd yet to ask them if theirs was one of the ones without the name filled in. I almost thought about just filling the names in myself! Maybe I should have? I'll have to let you know if I get any 'blank' rsvp's returned.